What if PM Abbott is right to describe Australia’s China policy as based on “fear and greed”? In late 2014, Australian Prime Minister Tony Abbott confided to German Chancellor Angela Merkel that Australia’s China policy is driven by “fear and greed.” Despite the media froth surrounding the revelation, the comment actually reveals that Abbott has more talent as a diplomat than was previously suspected. Using greed and fear as the basis for thinking about foreign affairs is hardly a new idea. The Greek historian Thucydides admitted as much over two millennia ago, when writing of the wars between Athens and Sparta. The battles he described were mostly precipitated by either the need to preemptively deal with an opponent before it got too strong (fear) or the desire to get hold of an opponent’s material or strategic goodies (greed). Robert Cooper noted over a decade ago that foreign affairs is the area of policy governments have least control over. To not be fearful, or to avoid the temptations of greed, would be unusual in this context. Both fear and greed, in different ways, are responses to the unknown. Two questions that arise from Abbott’s reported indiscretion are worth dwelling on. If Australia is greedy and fearful, then precisely what is the object of its greed and what does it fear? Oddly enough, the root to the answer to both these questions might be the same — Chinese money. Chinese wealth is the most evident cause of fear, through what are perceived as aggressive purchases of Australian real estate and land by Chinese individuals and companies, as well as the ways in which Chinese money now gives Beijing so much potential military and regional power. And yet Australian companies and the government often look very hungry to get their hands on this Chinese wealth — either through inward investment at home or by selling into China’s market. If at the same moment Australians are both greedy for Chinese money and yet fearful of the results of China’s wealth, they are not alone. Throughout the world, a similar ambiguity reigns. While Europe and America continue to berate China for its human rights and political problems and regard its geopolitical intentions with suspicion, they are also mounting increasingly ambitious campaigns to secure Chinese money through investment, tourist visits, and exports. In the same breath, leaders express reservations about China and then wax lyrical about how links with it can bring wealth. 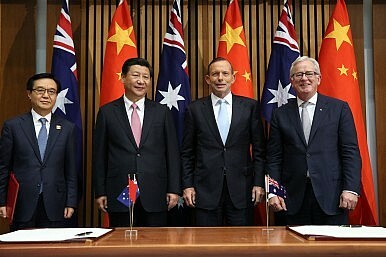 Against the backdrop of rising Chinese wealth, Australian leaders are not alone in being stuck between a rock and a hard place in policy terms — both wanting something (Chinese money) and knowing that the more they get what they want, the more potential problems they will have to face. Having achieved a succinct diagnostic of the problem, Abbott now can help his county, and the world, by trying to forge a coherent policy response. If we accept that fear and greed are going to play a role in relations with China, then the issue becomes how to manage these extremes without letting them get the upper hand. A foreign policy based too much on fear becomes incapacitated by defensiveness and caution. One based on greed becomes corrosive and unappealing, and eventually unsustainable. Allowing some space for moderate amounts of both is pragmatic and realistic. The aim is to manage these reactions, not to be managed by them. The first step in this process is to at least admit, as Abbott has, that fear and greed exist and play a role in shaping policy. A lot of Australia’s response to its “fear and greed” issue with China will show up in the implementation of the Free Trade Agreement due to come online later this year. This will be the chance for Australia to think more deeply about the kind of wealth it wants from China, the terms it needs to accept that money, and the relationship it wants in return. It will also inject some realism into the relationship, so people don’t become punch-drunk thinking of how opportunities with or in China are going to be the source of new fortunes. A realistic engagement framework with China is going to be dependent on confronting one’s fears, so that unfounded anxieties can be ignored but areas of real difference and threat can be articulated and risk management protocols set in place. Greed needs to be regulated by the simple ingredient of realism — understanding that the most sustainable relationship is going to be a two-way street, not a winner-takes-all game where the losers walk away with nothing. The Australian mining bonanza of the last few years, with its recent spectacular collapse, has been a timely reminder of how a country that looks at one moment like it is absolutely on top can end up suffering a sudden, complete reversal. One final point on Abbott’s comments: once we get over the squeamishness about admitting greed and fear play a role in any diplomacy, we also have to see the thousand different emotions and needs beyond these two extremes, and sometimes even within them. If you are going to be fearful or greedy, you may as well do so based on facts and knowledge, not chimeras. Australia’s aim now should be to transform fear into pragmatic, realistic engagement and greed into sustainable, mutual gain. Australia's ability to walk a geopolitical tightrope was on display during Abbott's visit to DC.